When you post a job with us, you can request that we collect applications and send them to you electronically in one batch. To enable this preference on Beedie Community, please select "Beedie Community System" for the application procedure. Interview our students at one of our three campuses. We'll provide the interview facilities, schedule interviews, and take care of the details, at no charge. To schedule on campus interviews, please contact us. The Careers in Business Job Fair is scheduled for Friday, June 15, 2018 and is intended for MBA-level students and experienced alumni. The BBA sales and marketing recruiting reception will be scheduled in July 2018. Contact us for more information. 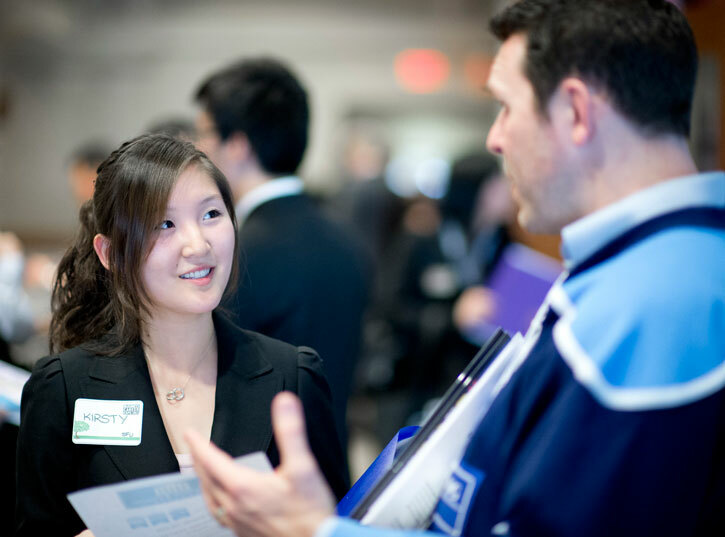 Invite colleagues from across your organization, including those who are SFU Beedie alumni, and give students an insider's view into your organization's culture, career opportunities, and hiring process. Sessions are subject to room reservation and catering charges. Schedule an afternoon or evening session by contacting us. Host our students at your company headquarters or provide a tour of your manufacturing facilities, and provide students with a glimpse of what it would look like to work at your organization. Schedule a visit by contacting us. Reserve a hallway table in a high-traffic area at the Burnaby Campus year round on Tuesdays, Wednesdays, and Thursdays (weeks 3 through to 10). Tables can be booked to a maximum of two times per semester, subject to a $75 charge per table per day. To book a table, log in to Beedie Community and visit the Engagement Opportunities section. Arrange to meet with students who are interested in learning more about your organization, one-on-one and at one of our three campus locations. To book an office space, at no charge, please contact us. We’re happy to help you develop a strategy that allows you to reach the target student or alumni audience best suited for your recruitment needs. Contact us for more information or to request a Recruiting Brochure.